Capture the heart of the family with personalized memorial & religious keepsakes! Christmas is the time of year when we celebrate all of our family traditions. Many families choose this time of the year to remember those family members who have passed on during the year. 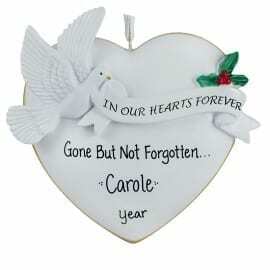 Create a heartfelt personalized memorial ornament to honor the loved one who will spending Christmas in Heaven. You can even select a pet angel to memorialize your furry best friend. If your family comes from different religious backgrounds, our amazing selection of Hanukkah and more generic winter celebration ornaments may be the perfect solution for holiday decorating. Each colorful keepsake can be customized to show your family dynamic. 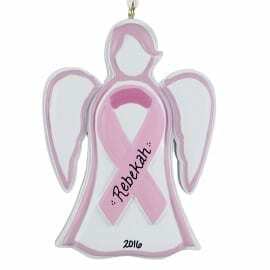 Browse our selection of thoughtful customized breast cancer gifts to show your support for a friend or family member battling a difficult condition. 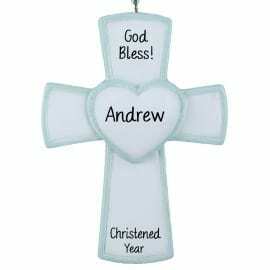 Our religious holiday ornament selection also includes unique ideas for commemorating 1st Communions, Confirmations, Baptisms and Christenings too. Our religious & memorial personalized Christmas tree decorations help to tell the story of a family’s life.